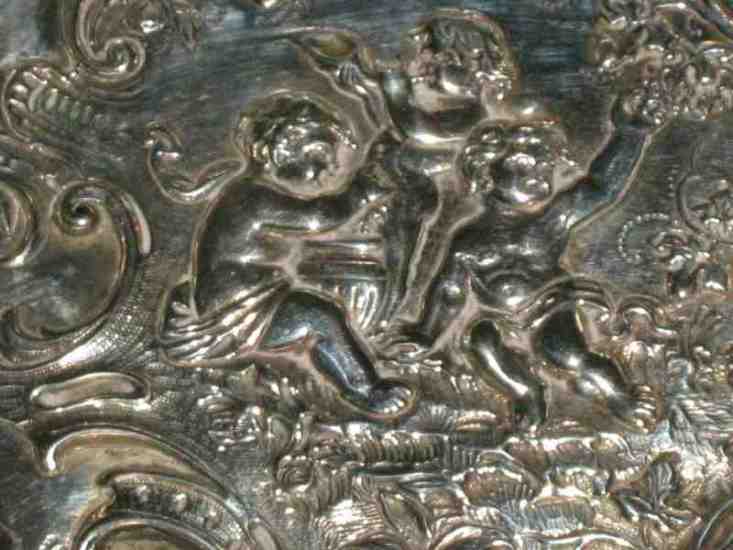 In this page I analyze the hallmarks of a silver sweetmeat dish decorated with rich embossing of cherubs and floral motifs, apparently marked with French 18th century hallmarks. 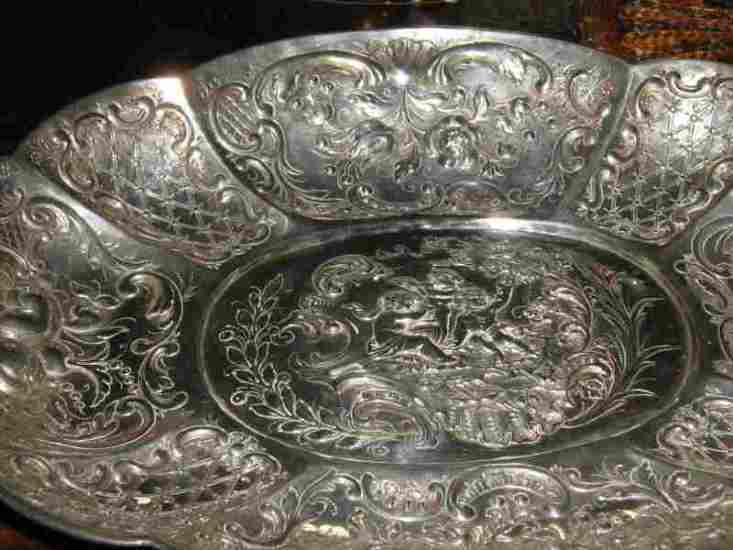 - the "poinçon de l'orfèvre" (maker's mark) Joseph Catherine Varlet, master silversmith active in Saint-Germain en Laye from 1745 until 1784 (initials JCV, crowned "fleur de lys" and a funnel between J and C); - a "poinçon de Décharge" (coquille = shell) used in Paris from 1756 to 1762. 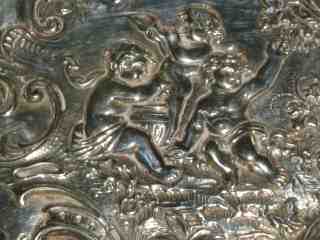 Various details support the assertion that these aren't authentic hallmarks. Here below are illustrated the reproduction of the authentic mark (left) next to the fake mark obtained from the image above (center) and the photo of an authentic mark (right). If you carefully observe the left leg of "A" you can note two small branches (scrolls) almost side by side. The fake mark bears only one branch, while the second is placed below, almost at the foot of the leg. The counterfeiter also ignores what is above the crown. 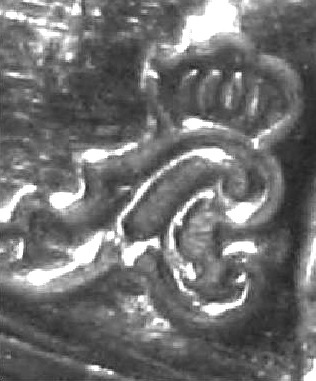 On the fake mark the crown has on the top what looks to be a minute or small dot, while, in the authentic mark, the top of the crown bears a little "fleur de lys" (often worn but, anyway, of round shape). Finally, the fake mark has sharp and thin legs on the "A". 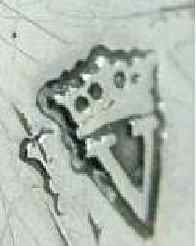 On the fake mark the crown is too small. In addition, the bars are too enlarged (on the authentic mark the bars are closer, so that punching often obtains a result looking as holes between the bars). Finally, the letter "V" on the authentic punch is always larger. The counterfeiter commits a blunder. The silversmith VARLET worked in Saint-Germain, and, at that time, this city had its own "poinçons de Charge, Décharge et de Jurande", different from those used in Paris! For example, the "poinçons de Charge" should be an ermine on two crossed branches of laurel. 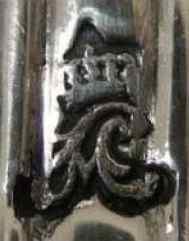 In addition, the "fleur de lys" (amid initials and crown) is very crudely drawn, probably by someone not familiar with the design of this symbol. Finally, the maker's initials are very thin (they should be larger). This symbol was in use only for small objects and certainly was never used for a dish. Sometimes, the official appointed to verify the collection of duty charges used the mark of "large objects" instead of that of "small objects", but such "mistakes" are found only on cutlery and never on a dish. - finally, the object itself: heavy chiselling and embossing vaguely inspired to country life in Chinese style (?) without no link to Louis XV taste nor in line with technical workmanship of most of French silversmiths. (note 1): was struck at the early beginning of the sketch. 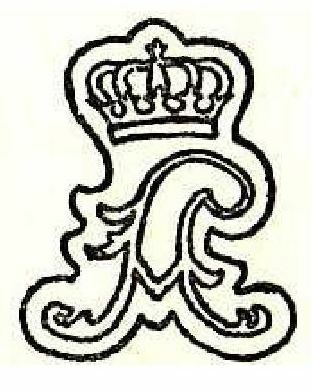 This mark meant that the piece had been declared to the tax authorities. Hence, this mark should be found side by side with the maker's mark. 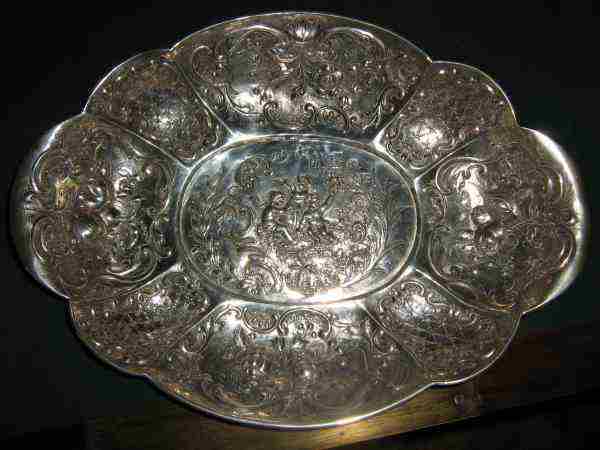 Its size was large, similar to the maker's mark. (note 2): this mark certified the silver content (958/1000 in Paris). The mark was an "alphabetic letter under an open crown", changed yearly. This allowed one to determine the precise year of the sale. All the letters were used, except "J" and "W". Furthermore, the "U" wasn't used under the Louis XV reign. (note 3): was the first mark to be struck, when the item was still a rough sketch. The maker's mark was stamped together with the "poinçon de Charge"
(note 4): was struck when tax was paid. Its size was roughly half as large as that of the Charge mark.